← Quicho from Taco Nazo in the News! We Love Los Guachos….and so does everyone else. Los Guachos has been in print quite a bit over the last year. It is well deserved. Of the hundred or so Taco Trucks that have come and gone as well those that have stayed and made a living, Los Guachos has consistently been among the best. The guys at Los Guachos have also done the best job of crossing over to the Gringo mainstream without compromising their food or culture. Earlier in the year they were in Maxim Magazine (with a quote from the “annointer of good things, Roland K. The Pierogi King of Columbus) Five Best Dinners from the Maxim staff . 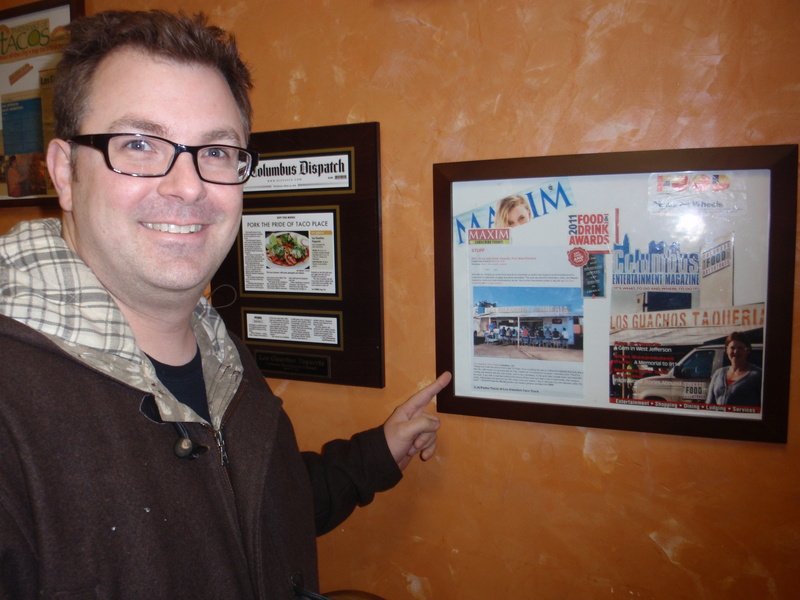 Most recently, Los Guachos was noted as the best in the Midwest and fourth in the nation by Every Day with Rachael Ray. Now think what you will of the Food Network celebrity but it is acknowledged that her staff do a good job at finding the best of the best. In this case they were dead on. So check Los Guachos out at their trailer on the west side or try them any day at their brick and mortar restaurant at Bethel Road and Godown in Northwest Columbus. hate to say it, but i gotta disagree. took the family there a few weeks back. we had tacos pastor, asada and pollo. meat was a bit dry, portions not too big – and the red sauce – muy caliente! the decor was interesting, but no mexican music? also those custom made chairs and table are very big and make getting around the restaurant quite an effort. i may go back and give it another chance – but mainly because most trucks can’t accommodate outside eating during the winter. did i just say winter? The media attention has been focused on the food at the Los Guachos truck and the taco that was nominated in Rachel Ray as best taco in the Midwest was the Al Pastor taco at the truck location. The truck location is the better experience in my mind. I’ve been to both and my experience at the restaurant has sometimes been on the dry side. I’m not sure why it is. I suspect that the restaurant doesn’t get as much traffic, so they have to shave the meat off before it’s time to serve. I’ve seen it piled up on the hot grill a few times. The truck location is busy enough where they will shave the meat right off the spit and into a tortilla. That’s my best guess as to the difference. The truck has always been spectacular. Los Guachos has the best tacos in America! Try and enjoy the real Mexican food. 5221 godown rd Columbus Ohio 43235. 1376 cherry bottom rd Gahanna Ohio 43230.